ing on Nicaragua's Mosquito Coast escalated to become a major ..... 17 See Michel Gobat, Confronting the American Dream: Nicaragua under U.S. Imperial Rule ...... Charles A. Conant and F. C. Harrison, would visit Nicaragua and develop an. 93. 'I love looking at living creatures. I'm a wild thing and I want to stay wild. And I want that for our children'. 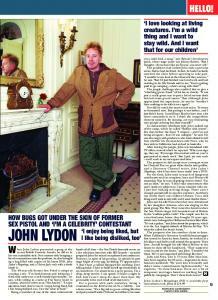 When John Lydon presented a gong at the. Phase diagrams for a class of models including the BlumeâEmeryâGriffiths model are ..... (c) For each choice of sign, Î½Â±(Î²,K) is a continuous function for K>K. (2). The patient had an arrhythmia and sudden death followed this. ... (neurogenic and/or myopathic) have caused nosological confusion. .... paroxysmal atrial tachycardia, atrial fibrillation, atrial flutter, branch block, second degree AV block. Emergency Telephone Number: Use only in the event of an emergency involving a spill, leak, fire, exposure, or accident involving chemicals. Within the U.S., Canada, or the U.S. Virgin Islands, call ChemTrec at (800) 424-9300, 24 hours a day. Or, outside these areas, call international number, +1 703 741-5970. Collect calls are accepted. · Information department: Environmental, Health, and Safety department. · Other hazards · Results of PBT and vPvB assessment · PBT: Not applicable. · vPvB: Not applicable. 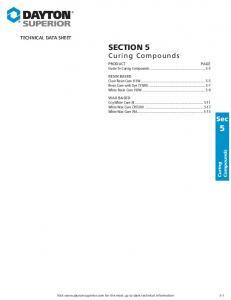 3 Composition/information on ingredients · Chemical characterization: Mixtures · Description: Mixture of the substances listed below with nonhazardous additions. · Dangerous components: 1344-28-1 aluminium oxide 1309-37-1 diiron trioxide 65997-15-1 Cement, portland, chemicals 14808-60-7 Quartz (SiO2) 7778-18-9 calcium sulphate, natural · Additional information: For the wording of the listed risk phrases refer to section 16. 4 First-aid measures · Description of first aid measures · After inhalation: In case of unconsciousness place patient stably in side position for transportation. · After skin contact: If skin irritation continues, consult a doctor. · After eye contact: Rinse opened eye for several minutes under running water. · After swallowing: Seek medical treatment. · Most important symptoms and effects, both acute and delayed No further relevant information available. · Indication of any immediate medical attention and special treatment needed No further relevant information available. · Advice for firefighters · Protective equipment: Because fire may produce thermal decomposition products, wear a self-contained breathing apparatus (SCBA) with a full face piece operated in pressure-demand or positive-pressure mode. 6 Accidental release measures · Personal precautions, protective equipment and emergency procedures Wear protective equipment. Keep unprotected persons away. · Environmental precautions: No special measures required. · Methods and material for containment and cleaning up: Ensure adequate ventilation. · Reference to other sections See Section 7 for information on safe handling. See Section 8 for information on personal protection equipment. See Section 13 for disposal information. 7 Handling and storage · Precautions for safe handling Wear appropriate personal protective clothing to prevent eye and skin contact. Avoid breathing vapors or mists of this product. Use with adequate ventilation. Do not take internally. · Information about protection against explosions and fires: No special measures required. · Conditions for safe storage, including any incompatibilities · Storage: · Requirements to be met by storerooms and receptacles: No special requirements. · Information about storage in one common storage facility: Not required. · Further information about storage conditions: Keep receptacle tightly sealed. · Specific end use(s) No further relevant information available. 65997-15-1 Cement, portland, chemicals PEL Long-term value: 50 mppcf or 15* 5** mg/m³ *total dust **respirable fraction REL Long-term value: 10* 5** mg/m³ *total dust **respirable fraction TLV Long-term value: 1* mg/m³ E; *as respirable fraction 14808-60-7 Quartz (SiO2) PEL see Quartz listing REL Long-term value: 0.05* mg/m³ *respirable dust; See Pocket Guide App. A TLV Long-term value: 0.025* mg/m³ *as respirable fraction 7778-18-9 calcium sulphate, natural PEL Long-term value: 15* 5** mg/m³ *total dust **respirable fraction REL Long-term value: 10* 5** mg/m³ *total dust **respirable fraction TLV Long-term value: 10* mg/m³ *as inhalable fraction · Additional information: The lists that were valid during the creation were used as basis. · Exposure controls · Personal protective equipment: · General protective and hygienic measures: Keep away from foodstuffs, beverages and feed. Immediately remove all soiled and contaminated clothing. Wash hands before breaks and at the end of work. Avoid contact with the eyes and skin. · Breathing equipment: Suitable respiratory protective device recommended. · Protection of hands: Protective gloves The glove material has to be impermeable and resistant to the product/ the substance/ the preparation. · Eye protection: Wear appropriate eye protection to prevent eye contact. 2.6 g/cm³ (21.697 lbs/gal) Not determined. Not applicable. Not applicable. 100.0 % No further relevant information available. · OSHA-Ca (Occupational Safety & Health Administration) None of the ingredients is listed. 12 Ecological information · Toxicity · Aquatic toxicity: No further relevant information available. · Persistence and degradability No further relevant information available. · Bioaccumulative potential No further relevant information available. · Mobility in soil No further relevant information available. 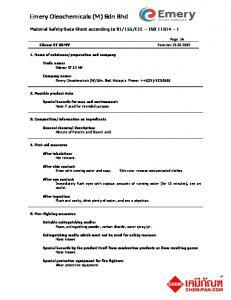 · Additional ecological information: · General notes: Water hazard class 1 (Self-assessment): slightly hazardous for water · Results of PBT and vPvB assessment · PBT: Not applicable. · vPvB: Not applicable. · Other adverse effects No further relevant information available. Same as listed for Standard Shipments above. GHS08 · Signal word Danger · Hazard-determining components of labeling: Quartz (SiO2) · Hazard statements May cause cancer. · Precautionary statements If medical advice is needed, have product container or label at hand. Keep out of reach of children. Read label before use. Use personal protective equipment as required. Obtain special instructions before use. Do not handle until all safety precautions have been read and understood. IF exposed or concerned: Get medical advice/attention. Store locked up. Dispose of contents/container in accordance with local/regional/national/international regulations. · National regulations: · Water hazard class: Water hazard class 1 (Self-assessment): slightly hazardous for water. · Chemical safety assessment: A Chemical Safety Assessment has not been carried out. Report "Emery Tuff - Dayton Superior"